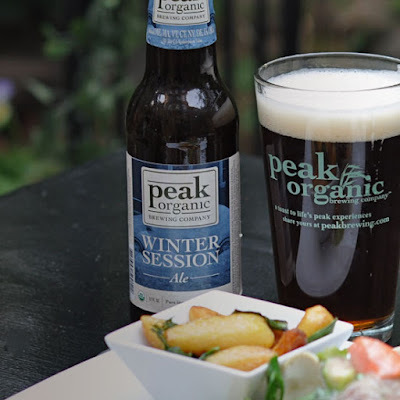 Peak Winter Session Ale (5.0%): Another release from one of my favorite breweries from East Coast, Peak Organic. It is one of their seasonal expressions which uses wheat as its grain. Look: Very dark amber, coppery color but crystal clear with almost no head. Nose: It starts very hoppy but then butter, fresh french baguette and sweet pastry crust aromas are filling in. Polished stainless steel, toasted bagel and lemon meringue pie at the end. Palate: Orange pound cake, lemon cookies, cookie dough, whipped cream and butterscotch. Toasted warm bread crust and unsalted butter like I got a lot from St. Peter's ales with mouth covering creamy sweetness. Just a hint of bitter-sweet middle-eastern spices at the end. Quite a doughy feast... Overall: This is an unusual but very tasty brew. I definitely didn't expect this from an American Ale. From nose to finish it was full of sweet surprises. I immediately purchased a six pack to put in the fridge. Highly recommended for English Ale fans. Would pair very good with beef salads, lamb chops and hors d'oeuvres. 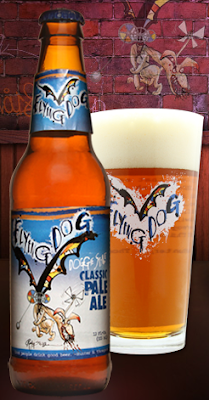 Flying Dog Classic Pale Ale (5.5%): This is the first appearance of Flying Dog Brewery at tire-bouchon. As one of the most successful breweries of the micro-brewery boom of 90's they are actually born in Denver, Colorado but operating now in Frederick, Maryland. Classic Pale Ale is from their regular line-up available nationwide. Another brewery from East Coast with an impressive selection of expressions and great label designs. Look: Dark amber, chestnut honey color with thin but firm white head settling down slowly. Nose: Malty and hoppy. More like an IPA. That nose reminds me taking a walk in the woods in Fall after rain: moist earth, pine cones and moss aromas. Palate: Doughy mouthfeel with rye bread and crust. I am getting piny notes but more like in the form of sweet pine honey. Moist turf I noticed from the nose is pretty dominant on the palate, too. Just enough amount of carbonation for this style. Everything you would expect from its name. Quite tasty... Overall: It's not a multidimensional and complex beer but a great example for a classical American Ale. Nobody could complain about it, totally a crowd pleaser. It would pair perfect with burgers and fried chicken. It definitely made me eager to try the other expressions from Flying Dog.